Topics: geology, ecology, history, archaeology, photography, & more. 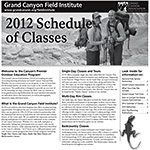 The Institute offers guided educational tours at Grand Canyon National Park led by expert instructors while hiking, backpacking, camping, & whitewater rafting. The Grand Canyon Field Institute (GCA) and Xanterra South Rim, LLC offer fun and informative Learning & Lodging Programs that combine lodging, meals, and two days in the field with an instructor.